“ We just wanted to say a huge thank you for everything you did on our wedding day. Your calming presence and patience really helped us to relax and enjoy the day even more. We loved the pictures you sent us the day after your wedding, it was such a lovely and unexpected surprise. We had an amazing day and treasure the memories forever. 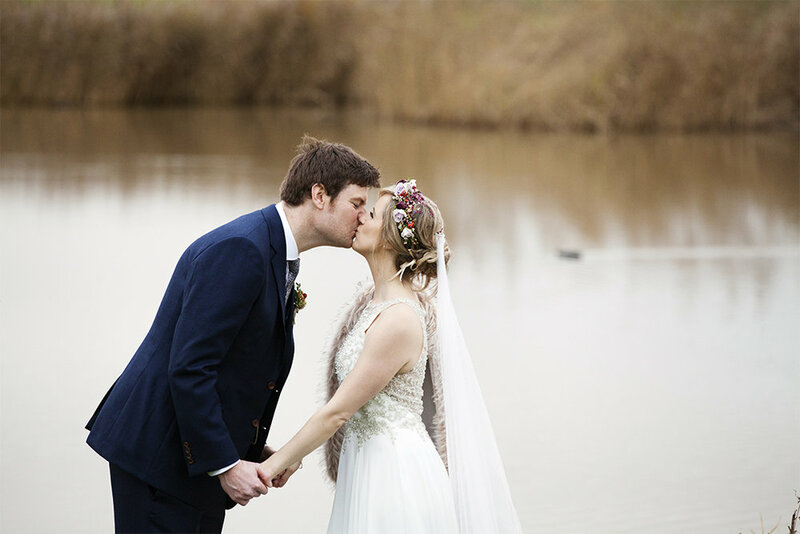 Congratulations to Hannah & Skylar on their beautiful Christmas wedding held at Quantock Lakes, Somerset this December. From start to finish I thoroughly enjoyed getting to know these two, and wish them many years of happiness for the future. Click on the image above or on the button below to see the highlights from their day! Inspirational, picturesque, beautiful, atmospheric and seamless are just a few words I would use to describe this Quantock Lakes Somerset wedding which took place on a glorious September day this year. Emma & Sam began their day by preparing within the grounds at Quantock Lakes very own wedding village. Hair and make-up were carried out in the bridal suite whilst the grooms party prepared in the adjacent, ‘posh piggery’. A romantic wedding ceremony took place under a twinkling of fairy lights in the Rustic Barn, and upon exit Emma & Sam were lovingly showered with confetti by family and friends. “You were incredible all day and managed to capture the essence of our perfect day despite all the rain. You knew when it was a good time for us to take time together and when to let us enjoy partying and laughing with our family and friends -capturing it all! " I have been visiting Quantock Lakes as a wedding photographer for the last three years now, and with each unique wedding it is a venue which never fails to impress me! It was a true compliment to have been asked to photograph this particular wedding as I would be doing so for the family who own this venue; what an honour! The wedding day itself was one of the largest I had ever covered, with 150 guests attending during the day, and 80 in the evening (you were all lovely)! When you are invited to photograph a couples wedding day, you are often invited into their very personal surroundings, to bear witness to some of their most intimate moments and to observe the dynamic of their family, and friendships which have grown and flourished, often over years. You are invited to see into someone's heart. For these reasons it is and always will be a true privilege to be asked to capture the precious moments which unfold on a wedding day. I was invited to Amy & Steve's home during the morning of the wedding where the bridal party prepared. Fun and games, tears and laughter were shared amongst the group, although the overriding emotion seemed to be excitement! Once hair and make-up were complete and Amy had dressed into a tremendous gown, herself and the bridal party made their way to Lupton House mansion in Brixham, where the groom and guests awaited. Voted by The Times newspaper as one of the best party venues in the UK. and with all its rustic charm it's easy to see why London couple Jenny and Tim chose Higher Eggbeer Farm in Devon as their wedding venue this summer in June. I had visited Higher Eggbeer on a number of occasions previously, but had not yet been given the opportunity to wander all of the rooms within the main house. With the entire day taking place at Higher Eggbeer, I was able to explore the entire house (where preparations were taking place), nooks crannies and all, and fell in love with each new discovery every step of the way.